Table 4 describes a hierarchy of models, listed roughly in order of increasing effectiveness in modeling grounded ice sheets with fast flow features. This is also the order of increasing need for data to serve as boundary and initial conditions, however, as also described in the Table. 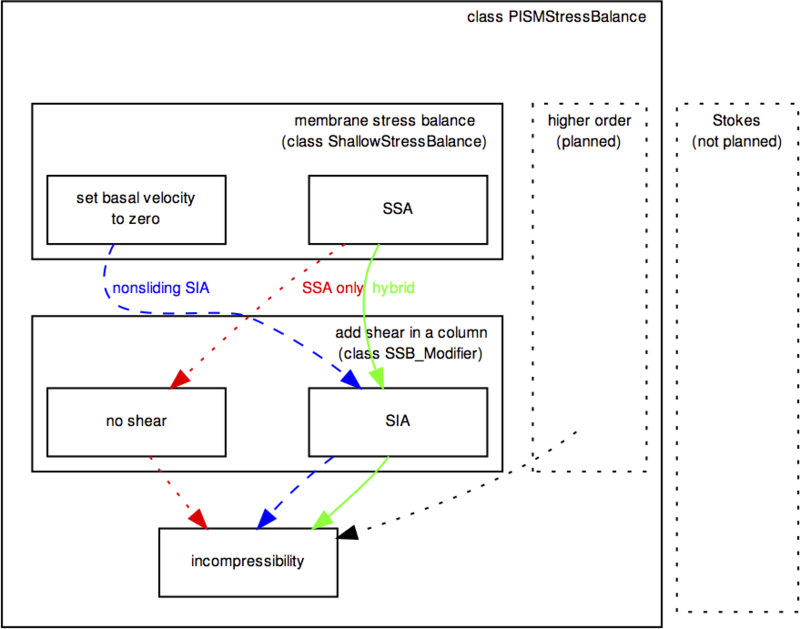 It may also be helpful to view the implemented stress balances as PISM software components (C++ classes). Fig. 14 shows the sequences of actions taken by the SIA-only, SSA-only, and SIA+SSA hybrid model components. In each case a membrane stress solution is generated first, then a distribution of vertical shear in the column of ice is generated second, and finally a use of incompressibility computes the vertical component of the velocity. The nonsliding SIA-only model has a trivialized membrane stress solution. The SSA-only model has a trivialized computation of vertical shear. Fig. 14 The SIA-only, SSA-only, and SIA+SSA hybrid models represent different “routes” through stress balance PISM components. In each case the inputs are ice geometry and boundary stresses, and the final output is a three-dimensional velocity field within the ice.